Elopement within the Catholic Church goes against the strict rules observed for marriage. While eloping is frowned upon within the Catholic Church, there are options available to Catholics if they get married outside the Church so their marriage is recognized by the Church. The process by which Catholics can make their elopement a recognized marriage in the eyes of the Church is called convalidation of marriage. Sometimes it is referred to as blessing the marriage or a re-validation of the marriage. Contacting your priest to discuss the options available based upon your unique circumstances. Obtaining baptismal records for both parties. Seeking a Church declaration of nullity, if necessary. Filling out the proper paperwork (usually filled out in conjunction with or by the appropriate authority, often your priest). Setting the date, time, and kind of service for the convalidation. Participating in the Sacrament of Reconciliation (confession) before the ceremony. Planning a social event afterwards to celebrate the convalidation. The process may vary slightly according to what you must do in order to have a Catholic marriage. Both parties usually end up attending marriage counseling sessions with the priest before the ceremony in which numerous articles of faith are discussed, including the Sacraments of Marriage.In the case where one of the parties involved does not see the need for setting a convalidation ceremony, a "sanatio in radice" may be sought, which is a retroactive convalidation from the time of the original marriage. This usually happens when one party is not of the Catholic faith and does not fully understand the reasoning behind the convalidation, according to In the Spirit of Cana. To avoid any question of validity in the Church or to avoid having to convalidate a previous Catholic elope, couples should take all the steps necessary to assure that their marriage will be valid in the eyes of the Church. Being excused from following Church law (known as Canons) by the proper authority is called dispensation from canonical form. According to the Archdiocese of Chicago, the dispensation from canonical form often requires sound ecumenical and inter-faith reasons. Usually this involves one party not being of the Catholic faith or the marriage being performed as a non-Catholic ceremony. Dispensations may be granted for other reasons, but those are the most common. Talk with your priest if you think you may qualify for a dispensation. When people refer to "elopement," they do not always mean a simple civil ceremony. Sometimes they are using elopement to mean a destination wedding. In these cases, it is possible to have a Catholic elope be considered valid. Places like Anse Chastanet Resort in St. Lucia may offer an elopement package that includes a ceremony in the Catholic Church, performed by a priest. At Anse Chastanet Resort, a notice of three months must be given, and the couple must go through pre-nuptial sessions with their home parish priest. A written confirmation from the priest is required before the Catholic ceremony. 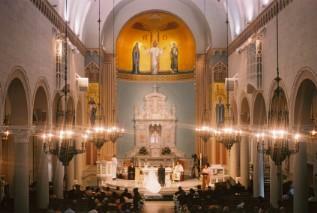 Couples who have other destinations in mind may be able to arrange a destination wedding through their parish priest. Find Catholic churches across the United States by visiting Catholic.org. Speak with your priest on whether it is possible to have a destination Catholic elope in another church and what is involved, should it be approved.